Posted November 13, 2017, in Student Alumni. 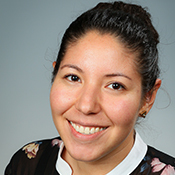 Carla Villacis is a first year student in the MA Experimental Psychology Program at Rutgers University–Camden. She obtained a B.A. in Romance Languages from Bowdoin College, where she also studied Psychology. Carla has applied her language skills through experiences teaching abroad and in translation services, including clinical evaluations. Most recently, Carla worked in behavioral health implementing clinical interventions in schools and clients homes. She supports the strengthening family Initiative by studying its impact on involved families. Page last updated by Senator Walter Rand Institute for Public Affairs at 12:31 pm April 4, 2019 . This page was printed from http://rand.camden.rutgers.edu/2017/11/13/carla-villacis/ at 8:58 PM Saturday, April 20, 2019.